Home > Fulgurite Lightning Sand Jewelry Art Gifts Tubes Glass Sculptures > Fulgurite from Florida Great Quality, Large Naturally Bended - Sold! Fulgurite from Florida Great Quality, Large Naturally Bended - Sold! This is quite a great, large fulgurite with that is naturally bended. Nice glass lining the interior chamber and see-thru side to side. Great specimen for your special geological collection or because you want something as romantic like from the Hollywood movies! When lightning strikes the ground its temperature exceeds that of the surface of the Sun! That is hot enough to literally fry anything that is in its path as the lightning bolt plunges into the earth. The all natural hollow tubes that the lightning strike creates are often beautiful and can range in color, size and shape. 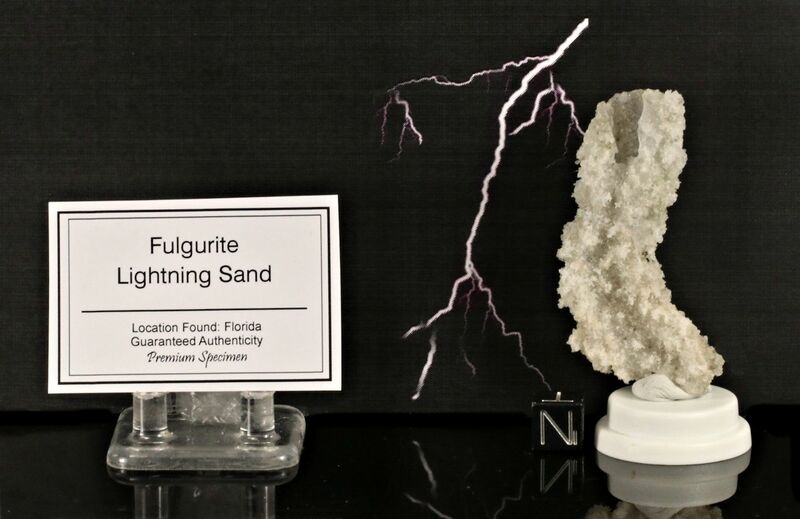 The name “fulgurite” is derived from the Latin word fulgur, meaning “thunderbolt.” Often referred to as “petrified lightning,” fulgurites are naturally hollowed tubes with sealed glass lining the interior of the tubes and small sand grains adhering to the outside of the tube. This fulgurite's size is: 2 3/8" L X 7/8" W X 1/2" D, 7.2 grams from Florida. One-of-a-kind specimen. Arrives with information, tag, and Certificate of Authenticity in a see-through display case. Guaranteed authentic. Lightning sand fulgurites are among the world’s top 5 most unique gifts. The Lore and Folk History of Lightning Sand: Promotes Good Luck, Success, Serendipity, Motivation, Hope, Enthusiasm, and Creativity.